Meet the second Luther: Nikolaus von Amsdorf. This lesser-known champion of the Reformation helped set the future of Lutheran theology on its course. Hear the history straight from one of the world’s best-known Luther scholars, Robert Kolb. Martin Luther called him “a theologian by nature.” He was Luther’s close friend and contemporary—born three weeks after Luther but living two decades longer. He was the only nobleman in Luther’s inner circle and one of the first Evangelical bishops. Known by his colleagues as a “fierce enemy of all corruption and adulteration of true Lutheran, Evangelical truth,” his contributions during the theological controversies after Luther’s death shaped numerous articles of the Formula of Concord. 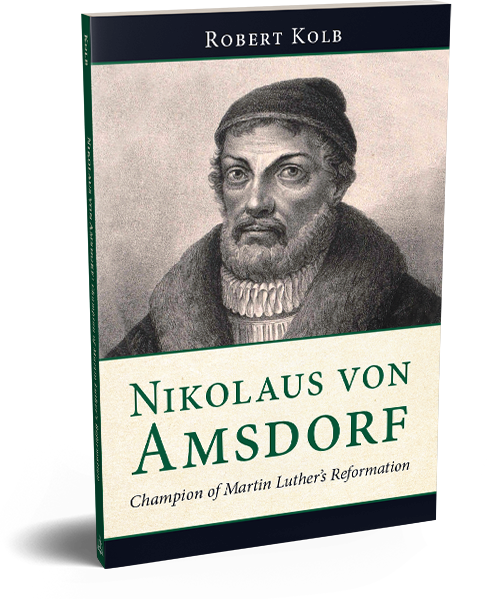 Yet few people today have ever heard of Nikolaus von Amsdorf, let alone his influence on Lutheran theology. In this thoroughly revised and updated edition of the 1978 book Nikolaus von Amsdorf: Popular Polemics in the Preservation of Luther’s Legacy, Robert Kolb opens the life and work of Amsdorf to readers of all experiences and backgrounds. Robert Kolb is a professor emeritus of systematic theology at Concordia Seminary, St. Louis, Missouri; author of numerous publications on the Reformation, systematic theology, and evangelism, including Luther’s Wittenberg World (2018) and Martin Luther and the Enduring Word of God (2016); and coeditor of The Oxford Handbook of Martin Luther’s Theology (2014).